The coconut definitive holds a little-known world record. 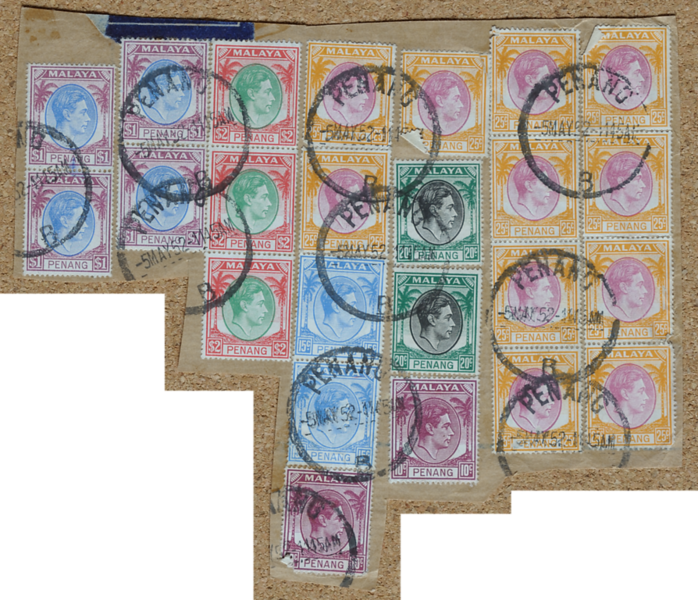 In 1949 they were issued with the world's most closely spaced perforations on the vertical sides—910 holes per metre in SI units, or 18.2 holes every two centimeters in philatelic convention. The horizontal sides were not far behind: 17.6 holes. The gauge difference was probably meant to compensate for the difference in horizontal and vertical tearing strength due to the directionality of fibres in machine-made paper (Harry Dagnall comm.). 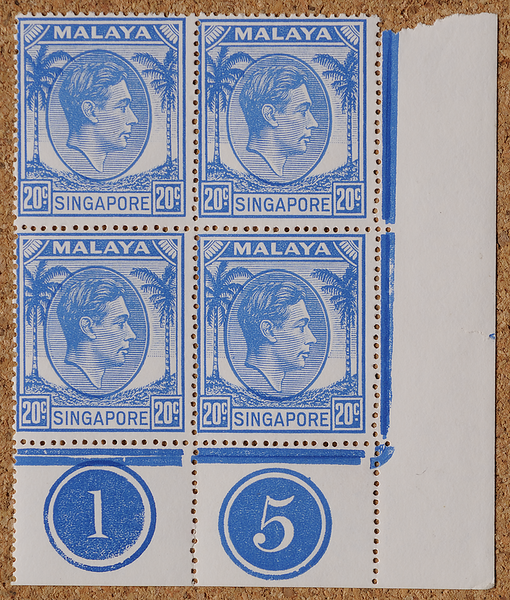 The switch from the long-used perforation 14 was made midway through the very first batch of printings in 1948 (Stanway 2009). It never caught on among the world's stamps, however. Halewood (2007) described it as 'hideous'; indeed, larger perforations have a more stamplike character. Furthermore, experiments conducted almost a century before had already shown that any perforation finer than 15 was too fine (Easton 1949). Early 16-gauge perforations of the Penny Red (left) produced sheets that came apart too easily, prompting the authorities to reduce the perforation to 14 in 1855 (right). The Malaya sheets, however, did not have this problem. The separability of stamps is a function of not only interhole distance but also hole size. While these stamps have the world's smallest perforation, the holes themselves are remarkably small, with a diameter of about 0.55 mm compared with the usual 1 mm (Mustacich & Lin 2018). This leaves ample paper between the holes to hold the sheet together. It is really the ratio of inter-hole distance to hole size that determines ease of separation. But a smaller gauge may be safer. There is less paper between adjacent holes for tears to propagate in the wrong direction and end in a torn stamp. This 20-cent quadruplet landed in the author’s care after a bidding war on eBay. It later voyaged across the Pacific Ocean to California, where Robert Mustacich measured its vital data, and made the return journey to Malaya where the author lives. The tiny perforations not only deviate from a straight line but also vary in gauge from hole to hole. Other cases of wriggly perforations were reported in various coconut definitives by Hale (2014, 2016a) and Lin (2015c), but this particular block is even messier with misregistered key plates and duty plates. 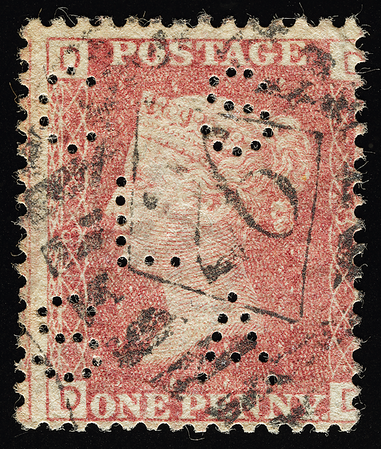 The pattern of stampwise repetition of misaligned holes in the horizontal and vertical perforations indicates the use of a single-row comb perforator through which the sheet was advanced row by row, a design that had long been in use at British stamp-printing firms (Simpson & Sargent 2004). 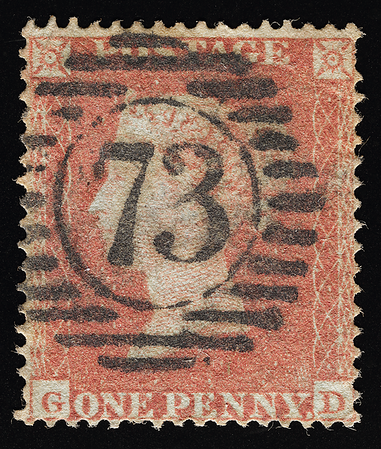 Examination of the perforation irregularities shows that the same comb was used on this block as the one used on the stamps of Hale (2014, 2016a) and Brown (2019a). The sheet, however, could be fed into the machine head-first or foot-first. The material cited above includes examples of both directions. Using geometric analysis (Mustacich 2015b), Mustacich & Lin (2018) concluded that the irregularities were almost certainly due to imprecise manufacturing of the perforator, rather than pins getting bent over time as was the prevailing opinion. To accommodate the bent-pin hypothesis, the mating holes in the perforator would have had to be implausibly large. A digital tracing of the perforations was made from a high-magnification scan. 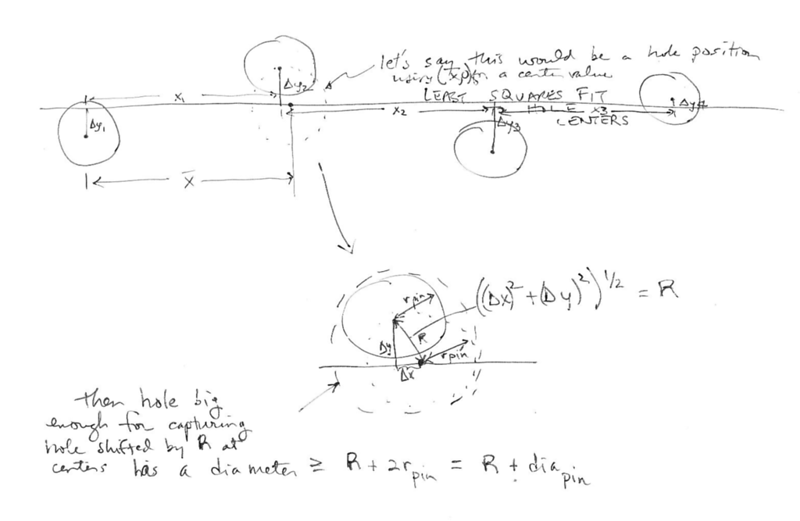 Each traced hole was least-squares-fitted to a circle to yield two initial data points, the measured radius in μm (upper number) and the quality of fit (lower number). Irregular hole edges give poor quality of fit. The crosshair marks the centre of the fitted circle. For more details see Mustacich (2015b). I believe that these are the most precise measurements of the perforations ever made. Philosophical transactions of Mustacich & Lin (2018). The faults are not limited to the margins, as shown above and in Hale (2016a). Wider blocks, or ideally entire sheets, will reveal whether the irregularities extend farther towards the middle of the comb. For unknown reasons, the vertical perforations seem more prone to irregularities. The world's smallest perforation has suffered from other ailments, such as missing holes due to a lost or broken pin (above). Yet it proved its worth through actual use in a high-volume definitive series. 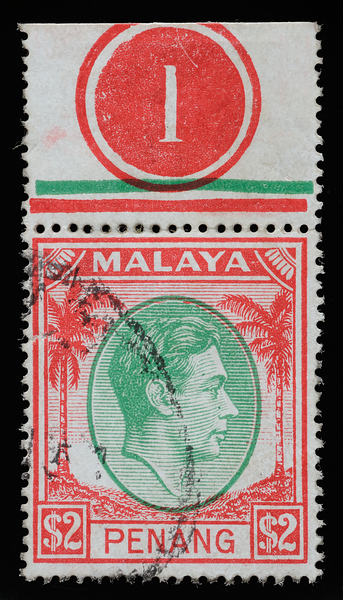 A rare pre-printing paper crease, showing ink spread out along the raised right-side fringe due to extra pressure from the printing plate. The stamp is marginally wider than normal. The black wavy lines intersect the white crease in a pleasing overlay of elements of modern art. A subtle design tweak accompanied the introduction of the tiny perforation. The outer rectangular frame was thinned down to the same weight as the inner frame, but for some values only. 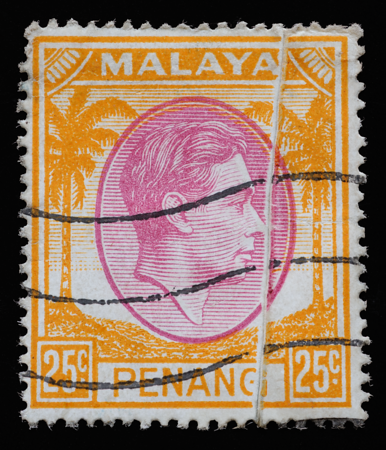 The change was later made universal in the Malay states coconut definitives. 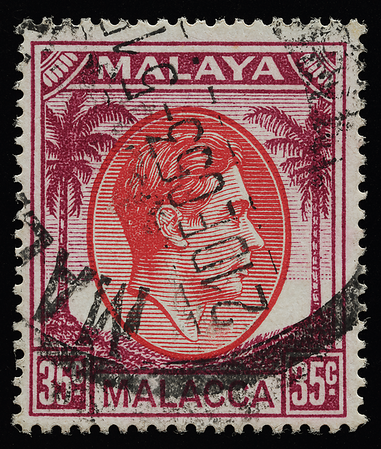 Malacca itself (above) has an especially colourful history, having gone through Malay, Portuguese, Dutch, British and Japanese rule.